Recipe courtesy of Star Tribune restaurant critic and 'cookie man' Rick Nelson, co-author of The Great Minnesota Cookie Book. "I think they have to look really good. Often cookies at holiday parties are presented on a platter with other cookies, and you really want the one that everyone goes for with their eyes first," said Nelson. Nelson also suggests that bakers make their cookies with whole ingredients, like butter rather than shortening or vegetable oil. Click the audio player above to learn more about great cookies for the holiday season. Note: This dough must be prepared in advance. 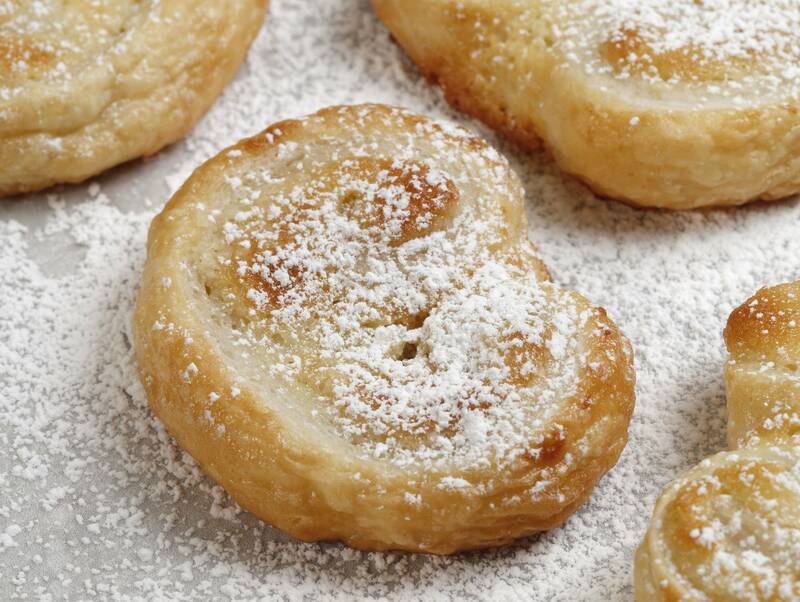 Palmiers (pronounced pahlm-YAYs) go by many other names, including elephant ears, palm leaves, and French hearts. Widely available Pepperidge Farm puff pastry works perfectly well with this cookie, but we loved the results we got using Dufour Pastry Kitchens puff pastry, which is more expensive. It's worth seeking out, because the all-butter product makes a gloriously light, golden, and flaky palmier. In a bowl of an electric mixer on medium-high speed, beat the butter until creamy, about 1 minute. Add the powdered sugar and almond paste. Beat until creamy, about 1 minute. Add the egg and almond extract, and beat until thoroughly combined. Sprinkle a surface with 1 tablespoon granulated sugar. Carefully unfold 1 puff pastry sheet over the granulated sugar and sprinkle with 1 tablespoon granulated sugar. Using a rolling pin, roll the puff pastry sheet into a 12-inch square. Divide the almond paste mixture in half, and carefully spread half the mixture evenly over the top of the puff pastry sheet. Carefully roll up opposite sides of the puff pastry sheet, from the outer edge to the middle, with the rolls meeting in the center. Firmly press together, wrap the dough logs in plastic wrap, and refrigerate for at least two hours and up to two days. Repeat with the second puff pastry sheet. When ready to bake, preheat the oven to 400 degrees and line the baking sheets with parchment paper. Unwrap the puff pastry logs and, using a sharp knife, trim off the uneven ends. Cut the dough into 1/4-inch slices and place (flat side down) 2 inches apart on the prepared baking sheets. Bake until golden brown, 12 to 14 minutes. Remove the cookies from the oven and cool for two minutes before transferring them to a wire rack to cool completely. Dust with powdered sugar, if desired, and serve.